We received an email from David Keyes at KeyesLabs today, with a detailed analysis of piracy in various countries. For those that don't know, David is the author of the battery saving app Screebl, and the open source licensing library AAL. A true pioneer in Android app copy protection. According to David's data, the often used excuse of "Paid apps are not available in my country" is at least partly bogus. He has customers from countries such as Nigeria, Kuwait, and the Ukraine who have found ways of purchasing apps through the Android Market, without the full market officially being available there. He also found most piracy comes from countries with full access to the Android Market, with as many as 2/3 of total pirated installs coming from these countries. Additional countries with extremely high piracy rates are Spain, Italy, and Australia with rates of 89% or more! Oddly, he found the piracy rate in Japan to be nearly non-existent, which I believe may be an abnormality or have more to do with a culture based on courtesy and respect. 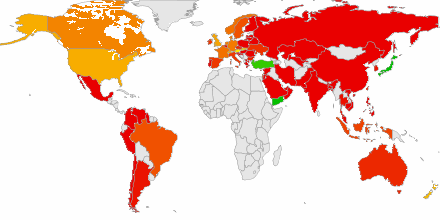 For further reading check out his original article, "A Global Piracy Heat Map". Remember that many app developers are trying to support families, and pay mortgages 99 cents at a time, we must support our developers for our platform to continue to grow.